The charismatic leader of the anti-austerity party Syriza-40-year-old Alexis Tsipras-won a historic victory in last Sunday’s election. Greece’s youngest prime minister in 150 years unveiled the country’s new government on Tuesday which includes three Turkish-origin Syriza MPs. The Turkish community in Greece has largely supported the anti-austerity party, says the head of the Istanbul-based Western Thrace Turks Solidarity Association, Taner Mustafaoğlu. “Apart from a recovery in the Greek economy they – Western Thracians – have an expectation on minority rights,” he says, referring to schooling and religious rights which he claims are underrepresented in the region. Numbers for the amount of Western Thrace Turks vary between 60,000 and 150,000. They are a remnant of the Ottoman Empire but are not recognized as ethnic Turks by the Greek government, which classifies them among other Greek Muslims. “Tsipras said that he wanted to see Western Thracians as equal citizens with Greeks,” says Mustafaoğlu referring to Tsipras’ comment made in Greece’s northeastern city of Komotini – Gümülcine in Turkish – 10 days before the election. A Western Thracian who supports Tsipras’ party is 65-year-old Ferruh Sözüner who has been living in Istanbul since 1956. “‘Left’ means freedom, equality and human rights and our expectations are mainly on education, economic, social and religious reforms in Western Thrace,” he says. As a financial adviser Sözüner does not believe that Syriza would be able to realize its promises on economics but is hopeful on minority rights. Greek-born associate professor on international relations at Istanbul’s Kadir Has University, Dimitrios Triantaphyllou, says: “Syriza’s victory came about because the Greek electorate is tired of further austerity measures which are entering their fifth year. “Thus Syriza’s message that Greece will not put up with austerity anymore struck a chord among voters,” he adds. For some, the January 25 election was a historic moment not only for Greece but also for the whole European continent. “Syriza’s pre-election motto was ‘Hope is coming’ and it is for this very hope that Greek people gave [them] their votes and put them in power-for the first time in Greece’s history a far-leftist party,” says 32-year-old PhD candidate in International Relations at Kadir Has University, Panagiotis Andrikopoulos. 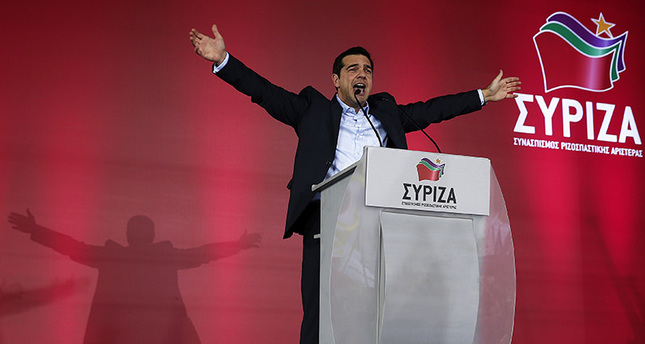 Syriza has already showed their intentions right away with a symbolic move, he adds. “For the first time in Greek political history a prime minister took his oath without the presence of the Christian Orthodox clergy,” Andrikopoulos says. Andrikopoulos, who has been living in Istanbul for the last four years, says that thousands of young and educated people decided to leave Greece because there was “no hope and future” for them there. “I cannot hide the fact that when I saw Syriza taking power and changing many things right from the beginning, immediately it crossed my mind that I would like to be there and live these changes,” he says. Hoping is free, they won’t get any more rights though.